I missed the lowland blossoming of big-leaf maples, but now that it's morel time in the foothills I get another crack at the floral, slightly sweet blossoms. Maple blossoms can be added to salads, sautéed, or even used to make pesto. I blended equal portions of maple blossom and fresh mint from the garden to make this simple pesto. The rest of the ingredients are standard. Adjust as you see fit. The amounts below make enough pesto for two. 1. 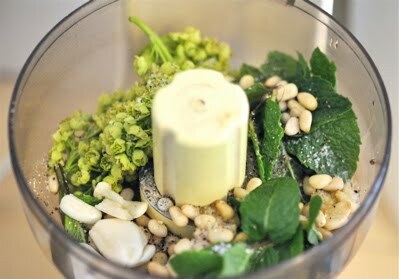 Make pesto in food processor. 2. Saute morels and asparagus in butter and olive oil over medium heat, turning carefully with tongs, 5 to 6 minutes. 3. Season scallops with salt, pepper, and paprika. While morels and asparagus are cooking, saute scallops quickly in a separate pan with butter over medium-high heat. Finish with a splash of sherry. 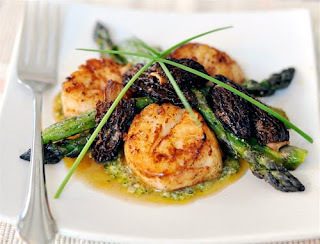 Allow sherry to cook off and make sure to get a crisp edge on the scallops. 4. Spread a dollop of pesto on each plate. 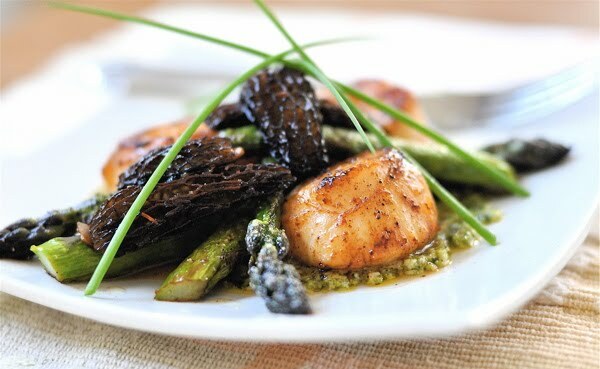 Arrange scallops, asparagus, and morels over pesto with a garnish of chives. After plating the meal, the scallops will slowly release their juices, mixing with the pesto to create a colorful sauce. The touch of sherry goes well with the pesto's hint of floral sweetness, and this in turn is balanced nicely by the earthiness of the asparagus and especially the morels. You never cease to amaze me. 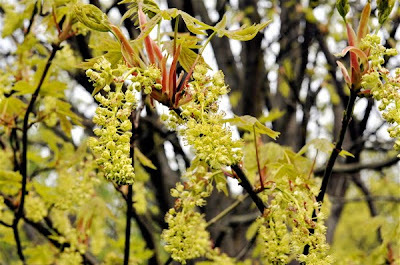 Who knew about maple blossoms? Ciao Chow Linda & Amber - I'm just starting to experiment with maple blossoms. Can't remember where I first heard about them as edibles, but I doubt they'll ever become a major food source for me--more of a novelty. The taste is subtle. Not sure how the flavor of the blossoms changes over the course of their flowering. I've seen pictures of harvested blossoms that run the gamut from mostly closed to fully blooming. Also, I wonder about other species of maple. I'll post more info as I get it. I remember discovering how wonderful maple blossoms smelled - didn't know you could eat them! Pretty dish! Ron from Herbfarm had been talking about big-leaf maples, which we don't get this far south. Need to get up there at some point and try them. Naomi - The smell of maple blossoms is indeed wonderful--and the taste, though subtle, might surprise you. Hank - Reminds me I need to call Ron and get us some rezzies! Bed Frames - I've gotten to the point where I just walk out the back door and randomly grab handfuls of herbs from the garden. Can't go wrong! Wow! Enlightening. I will be a regular to your blog for sure. I am just learning about all of the loal foraging our area has to offer. I got to them this year, just yesterday, finally! 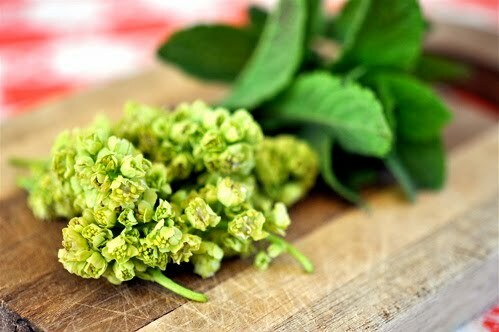 Made the pesto with the Maple blossoms and Mint I have growing in my garden, it is really great, did the whole recipe just as described, Scallops, fresh Morels, Asparagus, Maple Blossom Pesto!! It was super delicious!